President Trump’s initial budget proposal called for massive budget reductions to programs like environmental protection, safe food, and sustainable agriculture. Coupled with new policy initiatives such as a proposed but abandoned national healthcare law that would have caused 24 million people to lose insurance access, two attempts by the new administration to restrict immigration from predominantly Muslim countries, and an increase in immigration raids across the country are already having a ripple effect on our communities not only in the U.S. but also globally. If you are scared or angry or frustrated as you see families and communities torn apart or marginalized communities negatively impacted by the policies promoted by corporations and governments, you are not alone. The good news is you do have a voice and there are things you can do. Here are just a few action steps you can take. Communicate with your government representatives. Federal, state, and local politicians all represent you and you can let them know what kind of policies you want. Letters are great. Phone calls are better. And showing up at town halls and office visiting hour can be very effective for those who are able. If you know you are for or against a specific policy, state that. It’s also okay to speak more generally. But be sure to tell your own story and why what you are saying matters to you. Demonstrate your resistance. If you are able, join a march or public event to demonstrate your values and send a message to law makers about the kinds of policies you want. Several coordinated national and global opportunities are coming up over the next several weeks. Know your rights and educated others about their rights. The American Civil Liberties Union (ACLU) has put together some resources about your rights for immigrants, citizens concerned with privacy, marginalized and protected groups, and others. You can also contact your state ACLU chapter to find or organize a Know Your Rights Chapter. Join a local action group. A good way to get connected to others who are concerned and learn about additional ways to get involved is to join a local action group. Showing Up for Racial Justice is an organization dedicated to a fair economy without racism that has chapters in nearly all states. Thousands of local Indivisible groups have formed across the country to resist the agenda of greed and hate and insist that Members of Congress represent the people. You can also form an unaffiliated group that meets to discuss your collective knowledge and power and finds creative ways to resist! Support frontline organizations. Many people have highlighted the importance of supporting organizations like the ACLU and public radio during this time when the truth is debated and misconstrued and basic rights are at risk. While this is important, it is also important to support frontline organizations, that is organizations working directly with and for marginalized communities. 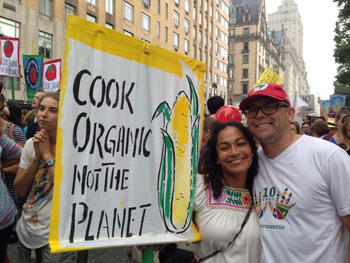 These organizations exist all over the world and may include farmer co-ops providing technical training and political advocacy for small-scale farmers, worker centers that provide trainings and services to food workers, Indigenous organizations fighting for land and seed rights. These organizations provide valuable services often on small budgets. When you find a frontline organization to support, pay attention to calls to action and make a donation if you are able. No one can do everything, but we all can do something. By working together we can achieve a just economy that runs democratically.